As the weather turns bitter and finals approach, nothing seems more appropriate than to kick off SEPTAdventures with some soul-warming diner food. 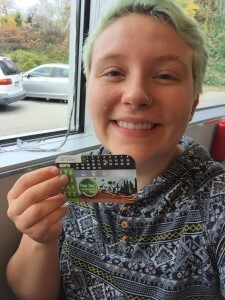 The Trolley Car Diner and Deli, my favorite Philly diner, is part of SEPTA Pass Perks. If you have a SEPTA independence pass, weekly transpass, or monthly transpass, that pass can be used to redeem any and all of the Pass Perks found at www.septapassperks.org. SEPTA Pass Perks is offering 10% off of takeout from the Trolley Car Diner, and we used this opportunity to grab some brunch! The Trolley Car Diner is located in Chestnut Hill and is really manageable to get to using SEPTA. I live in Germantown, so I hopped on the route 23 bus at Germantown and Penn st.. Route 23 runs down Germantown Ave, and dropped me off less than a block away from the diner. Route 23 includes a stop near Wayne Junction train station, so anyone coming from Center City or University City could take any train stopping at Wayne Junction and hop on the 23 for the rest of the trip. Jonathan, another YAC member, took the route 77 bus from St. Vincent and Roosevelt Blvd all the way to Chestnut Hill, which only dropped him off a few blocks away from the diner. Getting to Chestnut Hill from Center City is very easy. There is the route 77 bus as well as the Chestnut Hill East regional rail line—just get off at the Mount Airy stop and its less than a ten minute walk to the diner. The Market Frankfort Line can be taken to the 11th street station, where you can connect to the route 23 bus which will drop you off right next to it. No matter where you are coming from, there is a SEPTA route that will get you there. I recommend using the official SEPTA App to plan your route. After taking our respective routes, Jon and I made our way inside and picked up a menu to place our order. 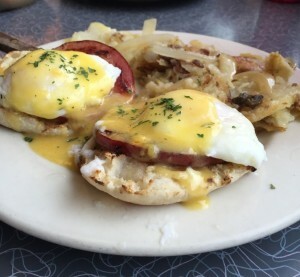 We both decided on eggs benedict—what’s more comforting than hollandaise sauce? We presented our SEPTA Independence passes and the discount was received. It was so easy! Your pass is all you need to redeem a Pass Perk. We received our take-out and found a nice spot in a coffee shop to eat our meal. The food was fantastic (as usual)! So creamy, so eggy, so Canadian bacony—it filled our bellies with warmth. The hash browns were perfectly greasy and salty with the right onion to potato ratio. It was a great meal, and the 10% off was a nice touch, especially for us two broke college kids!